CEFs’ tax advantages stem from the fact that they have skilled pros running the show—and these managers know how to cut the taxes you’ll pay on the big dividends they send you. Let’s dive into two often-misunderstood strategies they use to pull this off. Then I’ll introduce you to one of the strongest (and most tax-efficient) 8% dividends in the CEF space. It’s a perfect buy right now—especially with the April 15 tax deadline around the corner. Our first strategy is all about how a CEF manager optimizes your post-tax profits by how they buy and sell stocks in the fund. 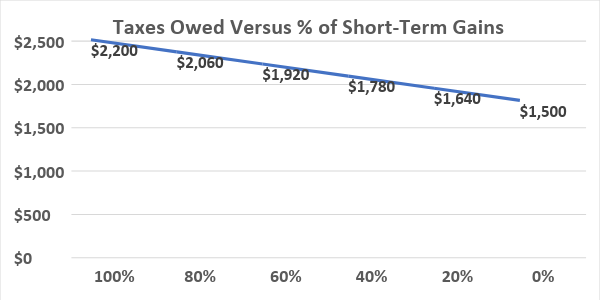 When it comes to taxes, short-term gains face a heavier burden than long-term ones. The IRS has strict definitions here: a short-term gain is when you sell an investment for a profit in less than a year; long-term refers to profits on a sold investment you owned for more than a year. The rate taxed on these will vary according to your income, but let’s assume a taxpayer is in the 22% income-tax bracket and gets a $10,000 profit on a $100,000 investment sold in less than a year. They’d owe $2,200 in taxes. But if that same taxpayer holds for over a year and is in the 15% long-term capital-gains tax bracket, they’ll pay $1,500, for a savings of $700—so you can see why these timeframes matter. Which brings me back to CEFs: they classify the gains they give you in the form of cash distributions as either long- or short-term capital gains, and you’ll be taxed accordingly. So if our hypothetical investor received $10,000 in dividends from a CEF, with $8,000 comprised of short-term gains and $2,000 of long-term gains, total taxes owed would be $2,060. The more long-term gains, the closer the total tax rate approaches the lower tax bracket: in this hypothetical case, 15% on the $10,000 profit earned. So by handing you more of your dividend as long-term gains, a CEF can significantly lower your tax burden. Which brings me to our second CEF tax-cutting play—and that hyper-tax-efficient fund I mentioned off the top. Our second tactic is easily the most misunderstood strategy in CEFs: return of capital. Yes, ROC sounds like what it is: the fund returns your capital to you. That sounds bad, as if the fund doesn’t invest your money at all, while charging fees just to give you back your own cash! That’s how CEF detractors paint the picture. And it’s almost always wrong. While some lousy CEFs invest in bad faith to provide lackluster returns just so they can keep collecting fees, the vast majority do not do this. Instead, what’s classified as “return of capital” is often an accounting move CEFs use to cut your tax burden. Here’s how it works: let’s say a CEF invests $100 in a variety of stocks and makes a $1 profit on stock A while posting a $1 loss on stock B and a 10% return on everything else in the portfolio. If the fund just sells stock A to pay for distributions, investors also have $1.00 in taxable capital-gains returns. However, the fund can sell stocks A and B and then give investors $1.00 in the form of a distribution that, for tax purposes, would be considered return of capital, since the $1 profit on stock A was negated by the $1 loss on stock B. 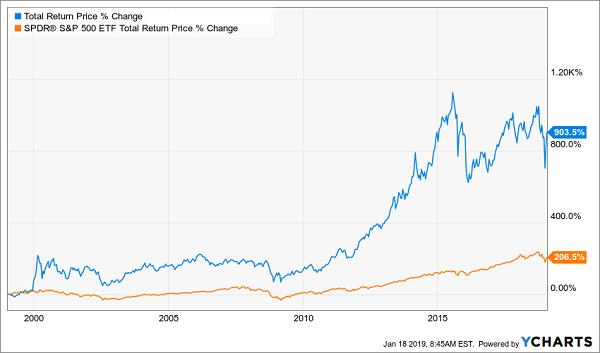 The fund can then buy a company that’s similar to stock B at the same time—say, stock C—and give us virtually identical exposure while legally minimizing our tax burden by getting us a return in the form of ROC instead of long-term or short-term gains. All the while, your total profits are exactly the same. Many hedge funds use this approach, and it’s both a legal and respectable way to prudently manage investors’ money. 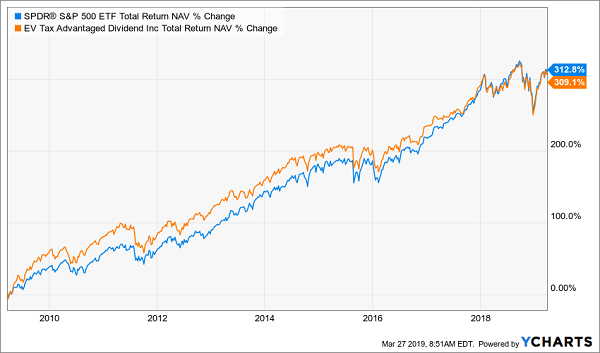 EVT has, in fact, been matching the S&P 500 for the last decade while paying an 8% dividend—even though the tax burden for Americans investing in an index fund like the SPDR S&P 500 ETF (SPY) would in most cases be higher. This is exactly how CEFs should work: lower your tax burden, meet or beat the index and give you a much higher dividend (SPY’s sub-2% yield doesn’t even come close). Now you can see how misunderstanding ROC can result in big (potentially life-changing) mistakes. Imagine, for example, putting off your retirement for years because you think the 8% distributions (including return of capital) on a fund like EVT are unsustainable. EVT isn’t the only high-yield CEF whose managers have your gains—and your tax bill—at heart. I’ve got 5 MORE cash machines run by whip-smart pros that do exactly the same thing. Best of all, these 5 powerhouse funds pay even bigger dividends. 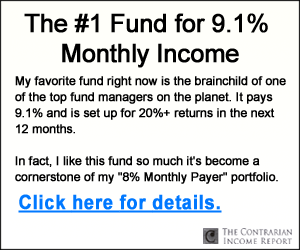 I’m talking an 8.3% yield, on average, with 3 of the funds in this exclusive “5-pack” paying out more than that—massive cash payouts like 8.8%, 9% and even 9.8%! Plus each of these stout income plays trade at ridiculous discounts to their true value, setting us up for nice 20%+ price upside to go along with their huge 8.3%+ dividend payouts. When I say the pros that run these funds are “whip smart,” I mean it. Take that 9.8% payer I just mentioned: it’s a pharma fund run by an industry legend whose been in the business for decades. He hires doctors, researchers and financial pros, then teams them up to sniff out the next big wave in the fast-changing biotech biz. You’ll simply never get that kind of performance from a “dumb” index fund! 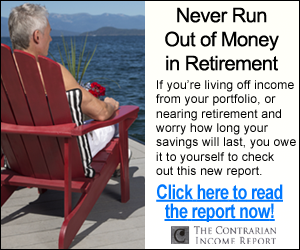 I’m ready to give you the name of this incredible 9.8%-payer now, along with full details on the 4 other tax-smart CEFs in this exclusive 5-fund retirement portfolio (average yield: 8.3%, forecast 12-month price upside: 20%+). Click here to discover all 5 of these high-yield funds: names, tickers, buy-under prices and everything you need to know to get in now—and start tapping their huge 8.3% average dividend today.